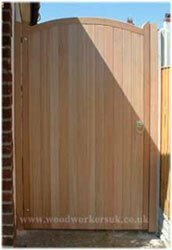 All our wooden pedestrian gates are manufactured in a choice of five timbers (unless stated otherwise) to the sizes YOU require. 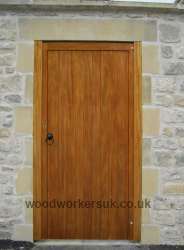 All pedestrian gates are based on a 2 3/4″ / 70mm thick, through wedged, morticed and tenon jointed frame. All of our wooden pedestrian gates can be customised please see ‘customise your wooden gates’ for more information. Our newest arrival – our Tudor arched headed wooden pedestrian gate. Based on a four centered arch, our new Tudor arched headed pedestrian gate is manufactured in hardwood (Meranti, Idigbo & European Oak) and modified Accoya Softwood only. Made to measure in widths up to 1016mm / 3ft 6 wide our Tudor arched gate is gate fit for a King (or Queen)!, and guaranteed to have your friends and neighbours talking! Also available manufactured to suit Tudor arched openings within brick or stonework – please contact us for more information. Based on a equilateral Gothic arch, our exciting Gothic arched headed wooden pedestrian gates are bespoke manufactured in hardwood (Meranti, Idigbo, Euro Oak) and modified softwood (Accoya) only and available made to suit your measurements in both height and width. Manufactured to a maximum width of 3ft / 915mm wide, allowing you something completely unique and individual. Want to fit our Gothic arched gate into a Gothic arched opening – we can make one to suit! Our Arched headed hardwood pedestrian gates is available and individually crafted to suit your measurements in both height and widths. Based on a semi-circular arch (non semi-circular versions are also available, please contact us for more information) the maximum width that we manufacture our arched headed gate to is 4ft (1220mm) wide. The Arched gate pictured is crafted in Meranti; versions in European Oak and Idigbo (Hardwoods) and Accoya (Modified Softwood) are also available to order. If you require a gate to suit an existing arched opening, then we can also help, please contact us. Our stunning close boarded Curved headed wooden pedestrian gate in Meranti (Hardwood).The curve on these timber pedestrian gates rises by 3” (75mm) from lowest point, though other rises can be accommodated. This pedestrian gate is also available in European Oak, Idigbo (Hardwoods), Accoya (modified Softwood) and beautiful Scandinavian Redwood (Softwood). This stunning gate features a curved ‘underswept’ head. Our Harlech pedestrian gate (pictured left, fully boarded in softwood) is available made to measure to suit your openings in Scandinavian Redwood (Softwood) and European Oak, Meranti and Idigbo (both Hardwoods). 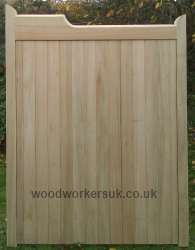 This is also available as open boarded and can be created for you with a matching pair of driveway gates. Incorporating a unique and graceful ‘dropped centre’ shaped head, which slopes down before returning up back to the original height, our Bala timber pedestrian gates (shown left in softwood) are available to you in Softwood (Scandinavian Redwood), and the hardwoods European Oak, Meranti and Idigbo. 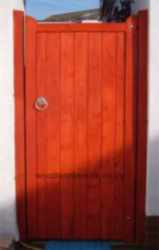 As with all our products, the Bala is a unique made to measure gate and is also available in an open boarded version. Imagine how eye-catching your home will look with a matching pair of wooden driveway gates as well. Pictured right is our straight-topped St Asaph pedestrian gate in softwood, featuring a linear top with ‘vision style panel’ immediately below. This attractive gate is available especially made for your specifications and sizes in European Oak, Meranti and Idigbo (Hardwoods) and Scandinavian Redwood (Softwood). The St Asaph is also available as an open boarded gate; just think, you could also have the matching pair of timber driveway gates adorning your house. Fabulous! Shown left is our Colwyn pedestrian gate in Idigbo (hardwood), The Colwyn features an asymmetrical angled top rail which rises by 6″ (150mm) from the lowest point. If you fancy something different, why not try these? The Colwyn gates are available made to measure for your home in European Oak, Meranti and Idigbo (Hardwoods) and Scandinavian Redwood (Softwood). 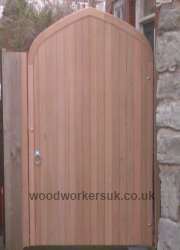 These are also available with a matching pair of driveway gates and also available as an open boarded gate. Why not have the set? Pictured right is our Nannerch pedestrian gate in Meranti hardwood (shown stained in a Mahogany stain). Our Nannerch pedestrian gates feature a diminishing gunstock head that reduces from it highest point by 2 3/4″ (70mm). As well as the Meranti version pictured, the Nannerch is also available made to measure in European Oak, Idigbo (Hardwoods) and Scandinavian Redwood (Softwood). The Nannerch pedestrian gate is also available as an open boarded gate and with a matching pair of wooden driveway gates. 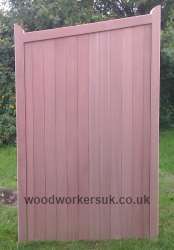 Shown left is our close boarded Denbigh gate in stunning Scandinavian Redwood (Softwood). These are available to you made to measure in European Oak, Meranti and Idigbo (Hardwoods) and Scandinavian Redwood (Softwood). The Denbigh is also available as an open boarded gate and also as a pair of wooden driveway gates. If required, the Denbigh can also be manufactured without the joggles (horn like protrusions on top corners of each gates) to fit within an enclosed brickwork opening. A gate as individual as you are? Contact us for more information! A what you cry?! If you’re looking for a gate that is more like a door i.e. built into an enclosed opening then check out our Postern gate page for ideas and inspiration. 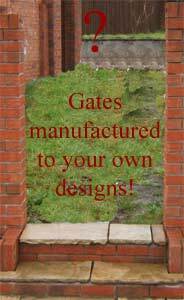 Postern gates are ideal for walled or secret gardens and any of our Pedestrian gates on this page can be manufactured and supplied as a Postern gate! 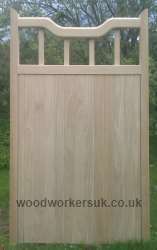 If you are after something individual or unique, or maybe you are trying to match existing wooden gates and you have your own gate design in mind, then please see our bespoke wooden gate page for more information on how to obtain a costing and get a gate manufactured to your own bespoke design. If you can sketch it, we can make it! 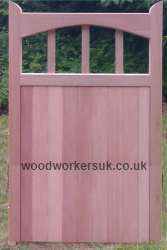 Interested in any of our wooden side gates? Obtaining a personalised costing for any of our wooden pedestrian gates couldn’t be easier; simply select your preferred style (don’t worry if you have more than one design in mind, we are very happy to provide costings on more than one style of our gates) and contact us via telephone for an immediate costing, or via Email (address at top of page), fax, or by calling into our workshops. If you are thinking of having a bespoke design, we would, in most cases, require a picture/sketch of the design in order to provide an accurate costing. To get a personalised costing on on any of our wooden driveway gates please use the form below. Do you intend to automate your pedestrian gate?